Austin Texas, Oct 7th, 2014 - TrustRadius, the leading community for professionals to share candid insights about business software, today announced the release of its TrustMaps™ for A/B testing software, which rank products based on user ratings and adoption within each market segment - small businesses, mid-size companies and enterprises. 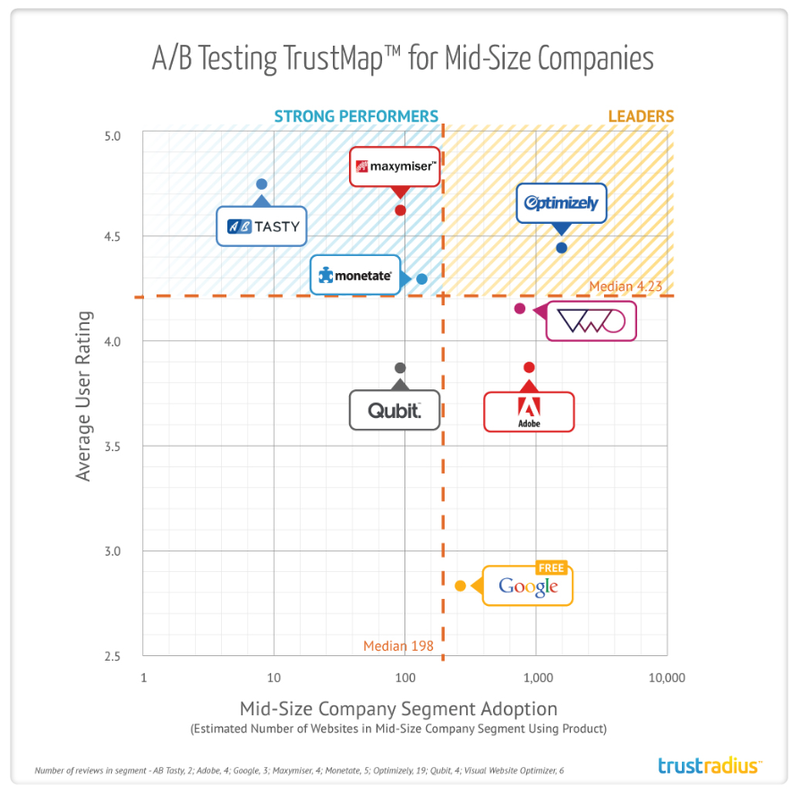 Unveiled in its first Buyer’s Guide to A/B Testing and Web Optimization Software, the TrustMaps™ quickly help software buyers locate the solutions most highly rated and adopted by their direct peer group and therefore most closely aligned to their needs. 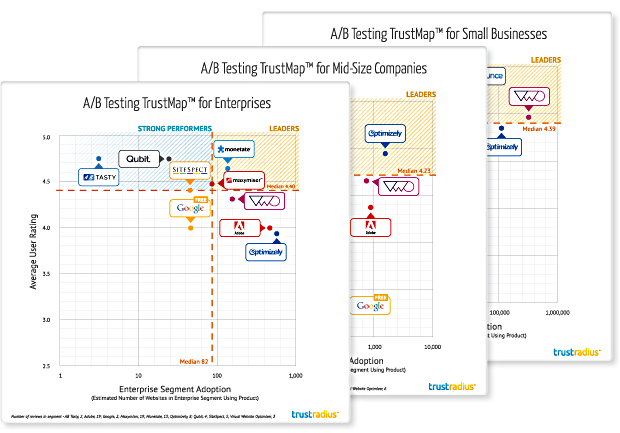 Each TrustMap™ depicts A/B testing products on two dimensions – likelihood to recommend ratings by users and the estimated relative number of websites using the product within that company segment size. 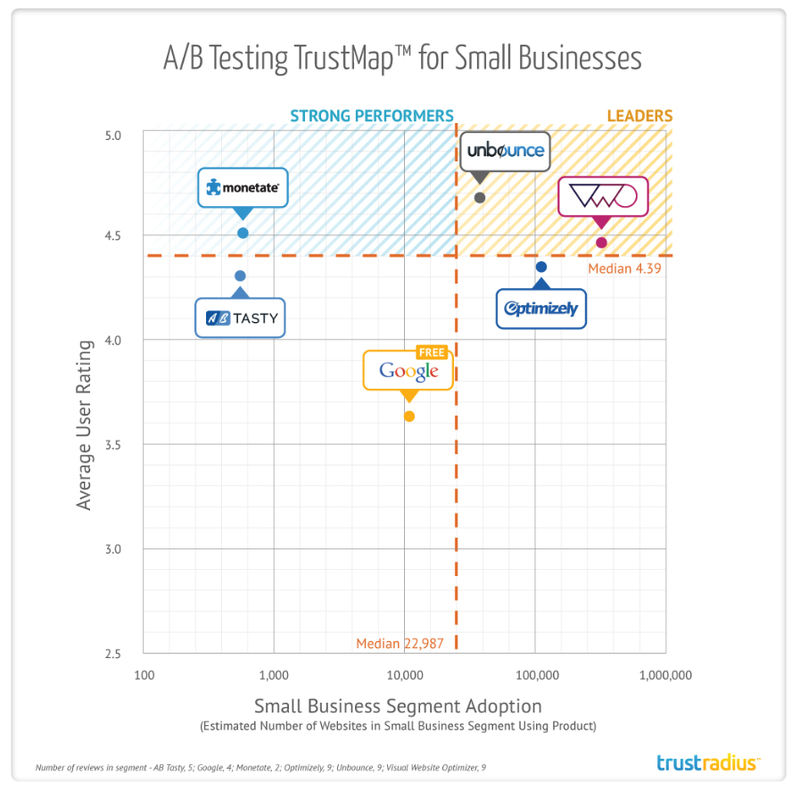 All ratings come from authenticated users of A/B testing tools on TrustRadius.com. The Buyer’s Guide also distills the pros and cons of each software product, as cited by software users in 200 in-depth reviews. Because success is not solely contingent on software selection, the guide includes a discussion of key factors for achieving success with A/B testing, drawn from interviews with highly regarded testing, analytics and conversion experts. Jason Burby, President, Americas at Possible says: "It is great to see a guide like this that covers large and small players, broken out by the size of clients' organizations as well. If you are evaluating any of these tools you now know the questions to ask each vendor during the sales process." 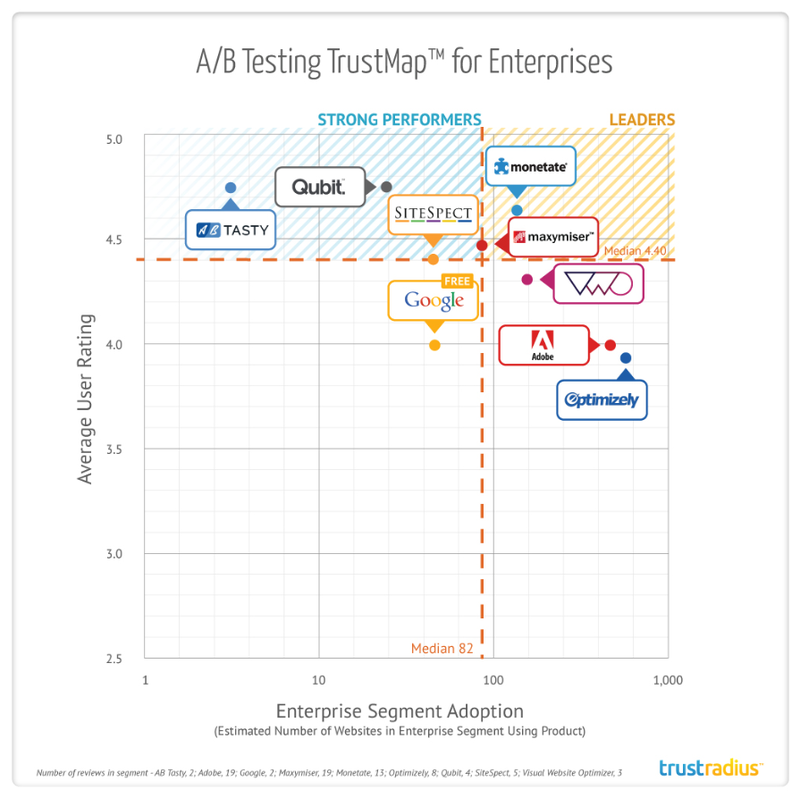 Strong Performers in the Enterprise segment are Qubit, AB Tasty and SiteSpect. Strong Performers with high user satisfaction but lower mid-size segment adoption are AB Tasty, Maxymiser and Monetate. The Strong Performer in this segment is Monetate. Though focused on enterprise customers, the tool is also highly rated among small businesses. In general, companies move from having one A/B testing champion, to a team dedicated to testing, to a testing-based culture, where different business units across the organization are involved in testing.